Made a cardinal in 1967. 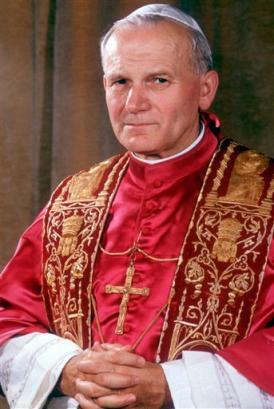 Became Pope on October 16, 1978. Survived assasignation attempt in 1981. Was the first non-Italian pope in 455 years and the first of Slavic origin in the history of the Church. Made over 100 trips abroad, travelling a distance far greater than that travelled by all other popes combined. Visited in 2001, Syria, Greece, and Malta to retract St. Paul's missionary journeys. First Pope ever to enter a mosque. Many thanks to Firas for supplying this additional information. asked Jews for forgiveness, went to a mosque, and gave gays some rights (not sure of that but i heard it form many people)..
so what's left to the new pope? he will be anyway just a pope; i mean we're not living in the middle ages when the Catholic church controlled Europe. and now most of the recent Europeans love him but they don't follow all what he says anyway, and sometimes most of them don't take it seriously, or even disagree with him. so the pope as i think is now a respected man more than being a considered man: he can not stop a war, but he prays for peace..
he can not stop starvations, but he calls for help.. and so on..
i know it's important to have someone like him, as a very good representative face, but i don't think that any other pope in this times will be different. and it's just an opinion.